People don’t usually associate Budweiser with the world of high-tech. More often, images of cool guys, hot girls and adorable puppies and Clydesdales come to mind. 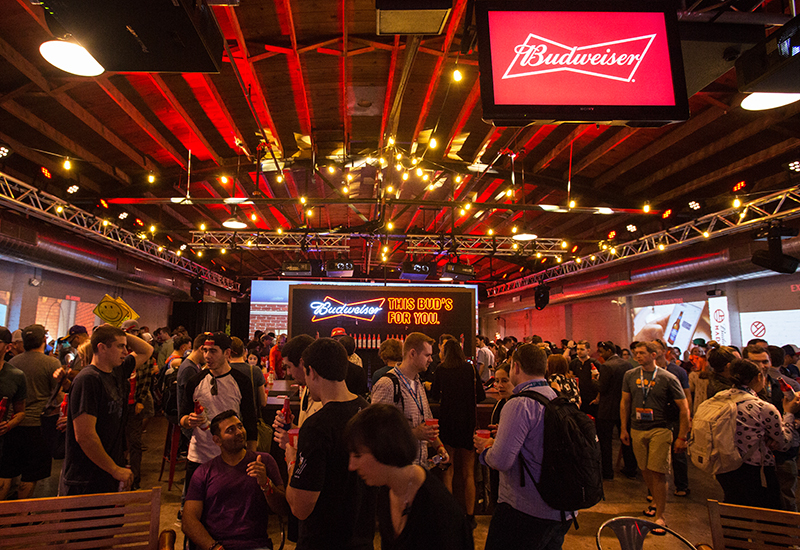 But the Budweiser Beer Garage at South By Southwest Interactive changed all that for attendees who stopped by the space at Ironwood Hall on 7th Street in downtown Austin where they got a taste of the technology behind the brand, including a 4D multisensory immersive reality experience. Budweiser’s parent company, Anheuser-Busch InBev, signed on as a first-time super sponsor of the festival. Inspired by the actual Budweiser Beer Garage in Palo Alto, CA (actual name: the Anheuser-Busch InBev Digital Center of Excellence), and the idea of start-ups such as Google and Apple that actually began in backyard garages, the activation reflected that loose type of environment where enthusiasm, creativity and thought leadership abound. “We wanted to create an inspiring environment that showcased how we have been using digital innovation to create relevant and tech-forward ways for consumers to experience our brands in all parts of their lives,” says Tina Wung, director of digital strategy and innovation at Anheuser-Busch InBev. 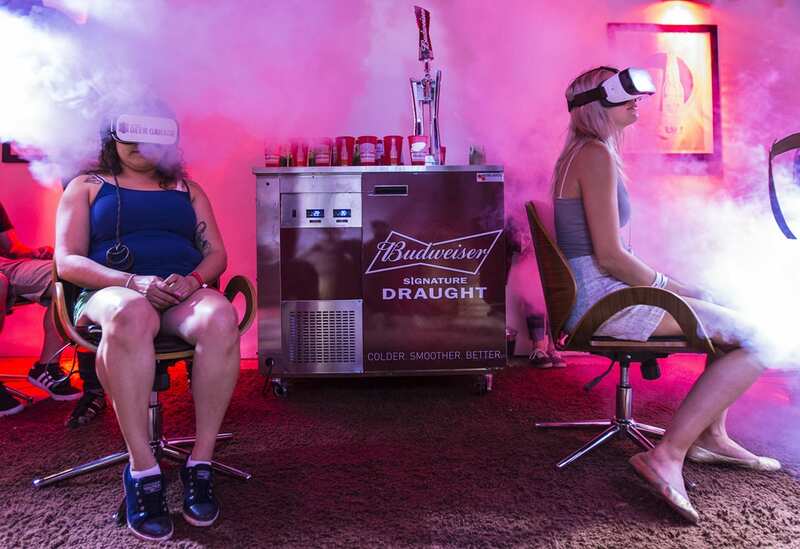 A 4D immersive reality experience, which took attendees on a virtual spin through the Budweiser brewery tour in St. Louis, was the garage’s main attraction. Attendees who donned VR goggles and went through the corporate VIP tour got to see where the Clydesdales live and witness how Budweiser brew masters conduct quality tastings. Scent, sound and wind effects added to the tour as attendees experienced temperature changes in the brewery, felt the breeze while walking from outside to inside, felt the beechwood chips and smelled the hops that go into the production. 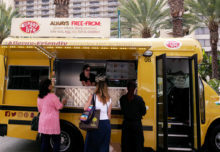 The activation was inspired by the actual Budweiser Beer Garage in Palo Alto, CA and the idea of start-ups such as Google and Apple that actually began in backyard garages. In the remaining space, five areas represented occasions in consumers’ lives where they enjoy the product—a bar/restaurant, in-stadium, in-store, in-home and a festival/party area. Each area showcased technology innovations appropriate to that space. 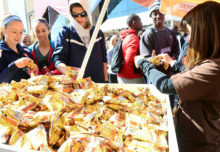 The in-stadium area, for example, featured DraftServ, Budweiser’s self-service machine that allows consumers of legal drinking age to serve themselves beer with the tap of a pre-loaded card. In-home showcased the Bud Light E-Fridge, a wifi-enabled smart refrigerator that tracks how many beers are inside and at what temperature, and alerts users when the supply is running low, then helps them reorder a fresh supply. To satisfy attendees’ thirst for programming, the Garage offered Start-Up Success stories, a series of fireside chats between an Anheuser-Busch innovation leader and start-ups such as Percolate, Saucey, Splash and Tinder, each of which have partnered with Budweiser in its quest for innovation. 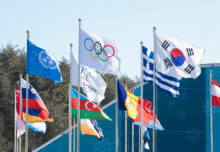 In addition, a Start-up Pitch Competition gave eight additional start-ups the chance to pitch their technology for the chance to win a pilot partnership with the brand and seed funding from its investment arm. “This was a great opportunity to get consumers, partners and the entrepreneurial community excited about partnering with us on emerging technology innovation and also an ideal platform to test out our 4D immersive reality experience,” Wung says. And to give them a sample of the beer, which was supplied at a bar located in the center of the space, through the DraftServ machine and after the 4D virtual reality tour (Agencies: Overall Execution: Pro-Ject, Chicago; 4D Immersive Reality Experience: The Uprising Creative, Los Angeles).